Money shifted from bonds into equities for the second week running as the Greek debt crisis deepened, in what may be the beginning of the end for the decades-old bond bubble. It was the second consecutive week of redemptions from investment grade bonds, which lost $1.9 billion, after 77 weeks of uninterrupted inflows. This is the end of the era of excess liquidity and of positioning in yield, analysts at Bank of America Merrill Lynch said. Government bond funds saw nine straight weeks of outflows, the longest outflow streak since January 2013. In the week that ended on June 24, $1.4 billion left government bond funds. Emerging markets debt funds witnessed their fifth straight week of outflows, with $300 million going out. High-yield bonds also saw outflows, for the third straight week; but in the week that ended on June 24, they were a modest $67 million. 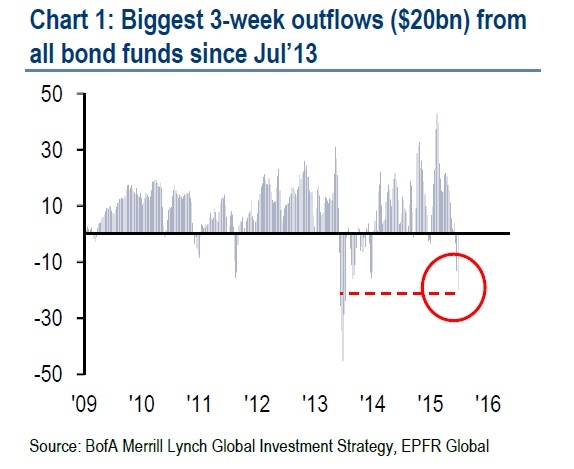 All in all, bond funds saw their biggest outflows in the last three weeks since July 2013, totalling $3.8 billion. The money mostly shifted into equities, which have seen inflows in four of the past five weeks. Stocks got another $4.6 billion in total last week, via ETFs. European equities got their largest inflows in 11 weeks last week, worth $3.4 billion. Of course this could change this week, because of the heightened volatility brought on by the referendum called for by Greek Prime Minister Alexis Tsipras. Japanese stocks, which have seen inflows in 17 out of the past 18 weeks, received another $3 billion. Emerging markets equities also saw inflows and they were relatively robust this time, worth $1.7 billion. US stocks saw their first outflows in four weeks, worth $4.6 billion. In their view, the most vulnerable assets are master limited partnerships (MLPs), investment grade debt (IG), real estate investment trusts (RETIs), dividend yield funds and high-yield debt. Less vulnerable are emerging markets debt (which has seen its price unwind over the past two years), gold and Treasury Inflation Protected Securities (TIPS). This entry was posted in News and tagged bonds, capital flows, debt, emerging markets, emerging markets bonds, emerging markets equities, European equities, eurozone equities, Federal Reserve, foreign exchange, high-yield bonds, interest rates, investing in bonds, investing in emerging markets, investing in equities, investing in stocks, investment grade bonds, Japanese equities, Japanese stocks, US equities, US stocks on June 29, 2015 by Antonia Oprita.